We are delighted to announce details of St. Columba's new Habitat for Humanity project. In June 2013, 20 pupils and 6 staff will travel to northern Zambia for two weeks, helping to build new homes with the worldwide charity. 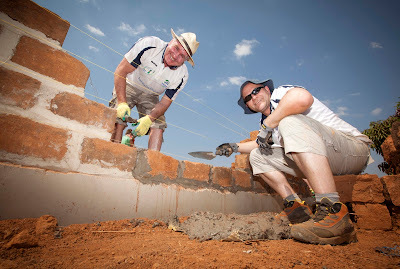 The picture above is of rugby legend, Brent Pope during his recent trip to Zambia with HFH back in June. After four extremely successful trips with HFH to Hungary, we felt it was time for an even bigger challenge and Zambia seemed like the perfect project for our highly motivated pupils. The team will need to collectively raise close to €80,000 and the team are already busy fundraising during their summer break. Individuals can now make donations online using our new MyCharity webpage (www.mycharity.ie/event/scchabitat) or participate in our various fundraising activities throughout the next 10 months - stay tuned to the blog to find out more. Below are the names of the pupils travelling to Zambia next June!